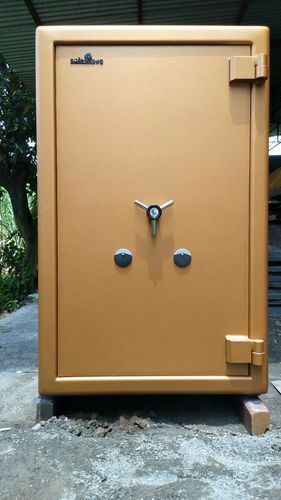 We bring forth for our clients, a superior quality range of fire & burglar resistant safes that is used for storing and safeguarding valuable articles like documents, CDs, cash, files and others in an organized manner. These are quality tested on well-defined parameters before being delivered to our clients. Our clients can avail these at competitive prices. We have 7 years of experience in the sphere of manufacturing and exporting a cost effective range of Industrial Security Systems, Safety Lockers, High Quality Safes, Fire & Burglar Resistant Safes, Depositary Safes, Drawer type Depository Safe and Slot type Depository Safe. Our range encompasses filing systems, office filing systems, fire resistant cupboards and safe compactors. Our range is appreciated by our clients not only for high tensile strength but also for resistant to corrosion and superior finish. Due to high end features, our range is widely used in banks, offices, schools and colleges. To ensure maximum utility to clients, we offer our products in different specifications. We, Safe Age Security Products Pvt. Ltd. conduct fire endurance test and impact & burglary test on our range so as to deliver flawless range of products to our clients. To manufacture these products in compliance with international quality standards, we have employed a team of experienced professionals. They perfectly utilize the available amenities in order to offer products as per the specifications provided by clients. We also provide installation and operational training to clients so that they do not face any problem while using our products. Our customer and quality oriented approach have enabled us to secure huge base of clients, situated all over the world. Some of our prominent clients are Kotak Mahindra, TATA AIG, Reliance Industries, HDFC and Aditya Birla Retail Limited.